These days I seem to feel more like reading books without necessarily writing about them afterward, which I think is fine in seasons. However, I know myself well enough to know that it's better for me to write about what I've read than to not, least I forget what it was that I found most compelling about any given read. Certain books give you pause and make you want to linger over great and interesting stories and Christy, by Catherine Marshall was that for me. On the heels of that one, I felt like reading a piece of non-fiction. 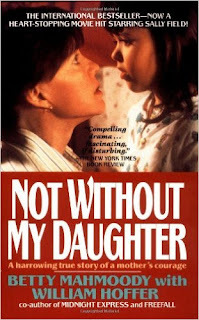 Earlier this year Suzanne from Living to Tell the Story read and reviewed the "sequel" to Not Without My Daughter and, as you can see from the comment which I left on her blog post, while I had seen the movie of the same title and knew it was a true story, I did not realize it was a book. After reading her review I promptly bought both books and have been staring at them for the last few months waiting for the right time to dig in. (When I purchased these books we were at the tail end of an international adoption of our daughter. I just couldn't bring myself to read them until we were through the process, not knowing how the read might effect my emotions at the time.) Well, here we are months later, adoption complete and I was definitely in the mood to read this amazing story. I launched into Not Without My Daughter assuming I'd spend a leisurely week with the book. Instead, I hastily devoured it, being absolutely unable to put it down. I had seen the movie shortly after it had come out and found it haunting. The book is more engaging than the film but that's due to 420 pages of details which allow for more background and history to be given in the telling of the tale. When I say I couldn't put the book down I mean that fairly literally . . . it traveled the household with me and I read chapters while cooking and cleaning, etc. It's quite riveting. If you are unfamiliar with Betty Mahmoody's story, it tells of her decision to accompany her husband Mood, and her daughter Mahtob, on a trip to Iran in 1984. Her husband claimed he wanted to visit his family back in his home country and that he wanted a chance to introduce said family to his American wife and daughter. Betty agreed to the trip but with great hesitations which she should have heeded. Agreeing and hoping to be in Iran for only two weeks, she and her daughter were devastated when their time in Iran was due to come to an end only to have Moody declare his intentions of staying in the country. He refused to allow for his wife and daughter to return to America and, under Iranian law, they were subject to his will. This book documents their time spent in Iran with Moody, trying to survive in a foreign country, while also attempting to escape back to America. Of course, the book exists only because they eventually made it back. Never fear - knowing that fact in advance will not spoil the book for anyone! Betty Mahmoody has an interesting and unique story to tell. Writing this book was somewhat cathartic for her and we see her developing and maturing as a person as the book continues. She does not write bitterly of her husband, but she also does not write an easy story. She tells the facts but shows respect for the man she once loved, despite the things he did to her during her time in Iran. It's quite simply an incredible and mind-blowing story that makes the reader appreciate Betty's trials as well as to learn from them. If you haven't yet read this book, I'd heartily recommend it. Is it a hard read, emotionally speaking? Yes. It's hard to imagine what Betty and her daughter went through while trying to return to their family and freedoms in America. It is also an exhilarating read as you watch her indomitable courage press on under truly traumatic circumstances. Lastly, it's an educational read which offers a peek into Iranian culture. This last aspect is something that is definitely going to cause some hackles to be raised as there already are arguments over whether or not Betty truly understood Iranian culture. I'll leave that for others to debate and simply say that the information Betty provides offers a good starting point for conversation between the differences in cultures and religions. This book would make for an excellent book club discussion should you be in need of such a suggestion. I definitely encourage you to find this book and give it a read if you have a chance! If you found the movie haunting (as I did) you'll find the book more so. This isn't a title I'm likely to ever forget, truth be told. Thank you, Suzanne, for recommending these books to me! Fairly quickly after concluding Not Without My Daughter, I picked up My Name is Mahtob . You can read my review of that title HERE. One of the reasons I found this book so compelling was how Betty wrote of the ordeal and her husband factually and interestingly but without a hard edge of bitterness. It was amazing to me. The story is absolutely scary and I keep asking myself would I have been able to have her courage. Glad you liked the read. Somehow I've neither read the book nor seen the movie, though I'd heard of them. Sounds like quite a compelling story!